Ni hao! I made it to China. That was one really long flight. 13 1/2 hours to be exact. Then after all that we had to taxi for 25 minutes before pulling up to the gate. By that point I was really ready to get off the plane and stretch my legs. But it was so worth it! Suzhou is awesome. The people have been very friendly. Though I have not done much exploring outside of the hotel yet, we did go out to dinner with 2 local girls that Jesse works with and that was a great experience. I let the 3 of them do all the ordering and I was a good girl and tried it all. I didn’t really not like anything, though I only ate one piece of the chicken because I have a hard time getting past the bones. My favorite was a stir-fry like dish with cabbage, green peppers, spicy red peppers and green garlic scapes (which I had never heard of but were amazingly delicious). I don’t think I will have any problem finding food to enjoy while I’m here. I’m just going to remain open minded and remind myself that anything I don’t like I can just skip next time. 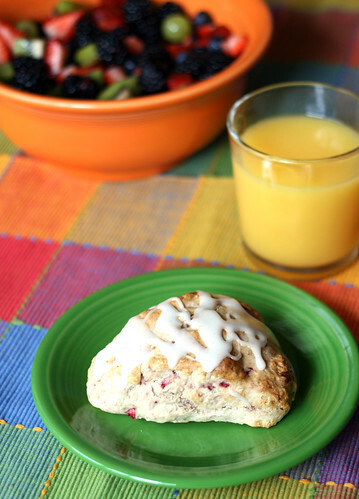 I made these scones for a quick and easy breakfast while my parents were in town. I prepared the dough a few days in advance, then I shaped the scones and froze them. It was so easy and they tasted like I had just made them. Give this a try the next time you have company coming in town and want to spend more time visiting than in the kitchen! To make and bake right away, pre-heat oven to 425 degrees. To freeze and bake later gather saran wrap and a gallon sized ziploc bag. Start by splitting and scraping the vanilla bean. In a large measuring cup whisk together the eggs, milk, half and half, vanilla extract and beans from the vanilla bean. In a small bowl take the sugar and remaining vanilla bean “skin” and rub together between your fingers, until the sugar starts to become fragrant, then remove the bean. Place the bean in another small bowl (or ziploc baggie if you plan to freeze scones and bake later) and mix with the confectioners sugar. Set aside for later use. In a large mixing bowl, mix together the flour, baking powder, salt and sugar. Using a pastry blender (or 2 forks) incorporate the butter chunks into the dry ingredients until it starts to resemble wet sand and there are no butter chunks bigger than a pea. Using a wooden spoon mix the wet ingredients into the dry ingredients, then carefully fold in the strawberries. Turn out the dough onto a lightly floured surface and kneed with hands for 1-2 minutes. Shape the dough into a ball and then flatten into a large circle. Cut the circle into 6 even wedges. To bake now, place the wedges on a baking sheet fitted with parchment paper about 2 inches apart. Bake for 15-18 minutes until golden brown. Remove to a wire rack to cool. To bake later, set scones uncovered on a plate in the freezer for 30-60 minutes. Remove from the freezer and wrap each scone in saran wrap and place in a gallon sized ziploc bag, then return to freezer. When you are ready to bake remove from freezer and saran wrap and follow directions above only baking for 18-20 minutes. While the scones are baking, rub the vanilla into the confectioners sugar then remove the beans and discard. Add milk 1 Tbsp at a time and blend with fork until the glaze has the consistency of thick syrup. 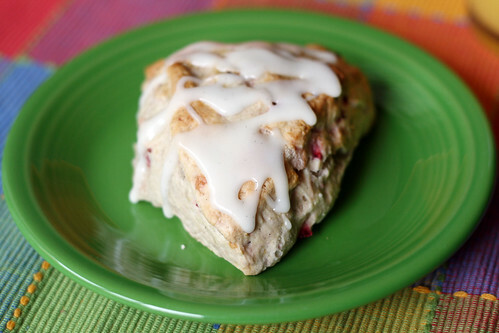 Drizzle the glaze over the scones and serve warm or room temperature. *Vanilla beans can be expensive so I made sure to really get my moneys worth out my bean by rubbing it into both the granulated and powdered sugar. I think it really added to the vanilla flavor but these steps can be skipped. If you have enough time to plan ahead, vanilla beans can be purchased on Amazon.com for a much more reasonable price.